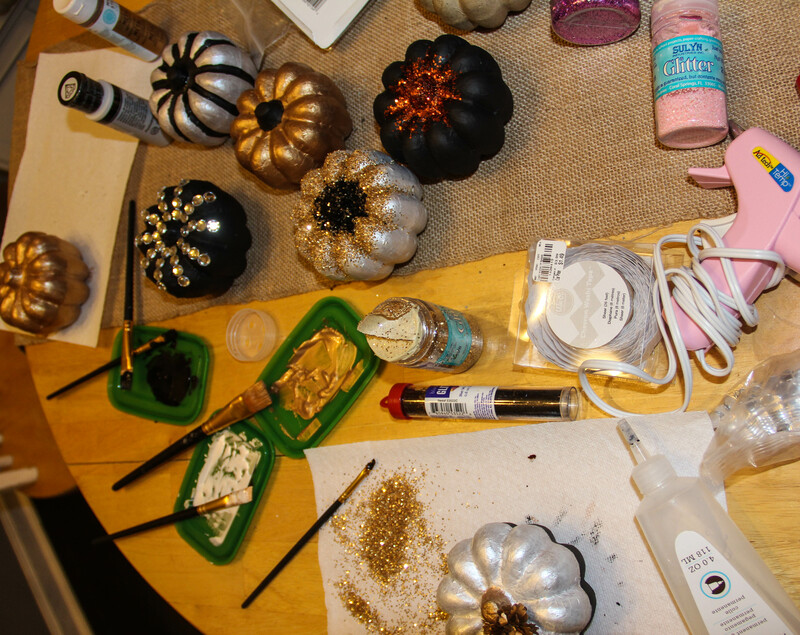 For today’s ‘how to’ post I am sharing the fun pumpkins the hubs and I decorated a couple of weeks ago. 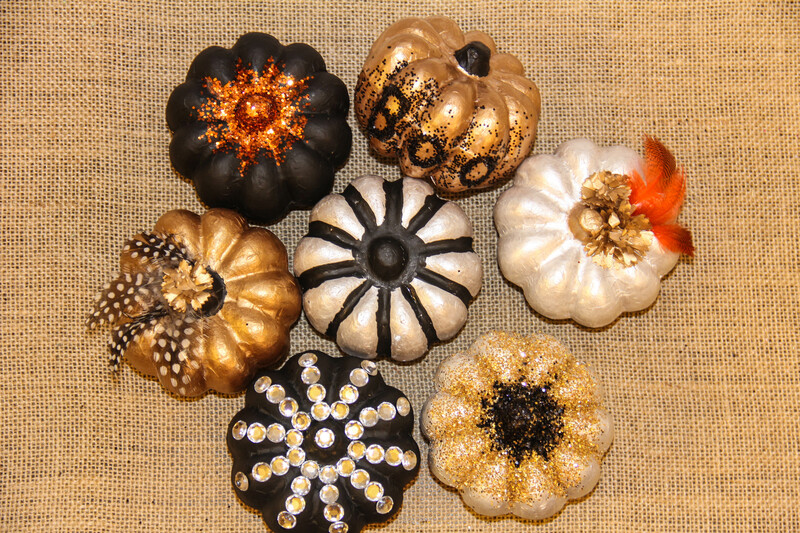 I realize that Halloween has come and gone but that doesn’t mean you can’t decorate pumpkins for Thanksgiving! 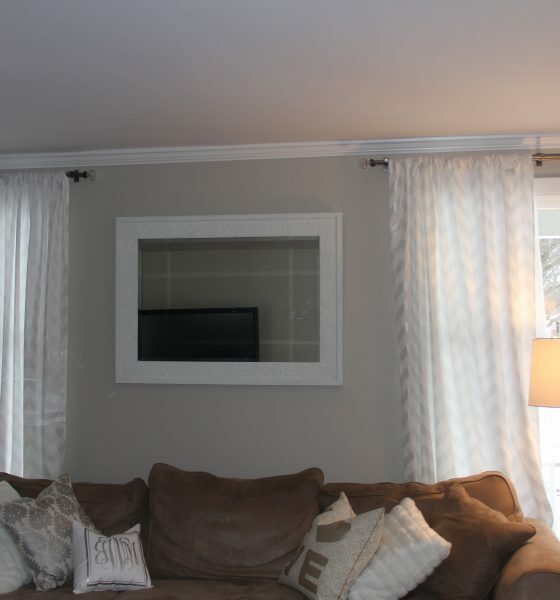 Come up with a color scheme and go from there! 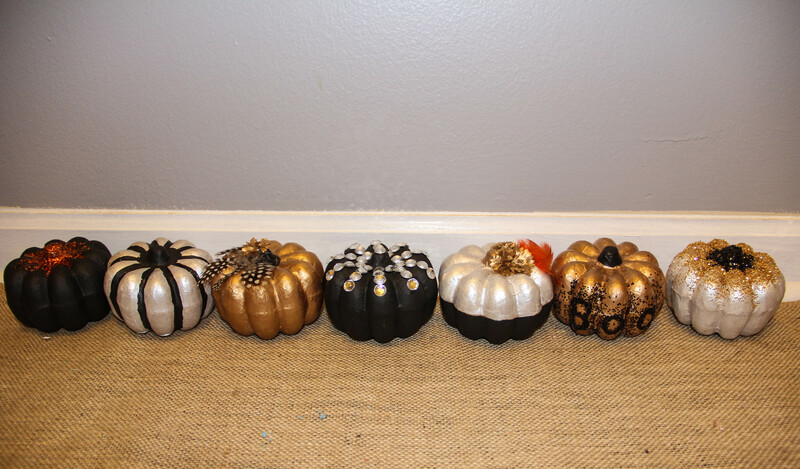 I love to craft so I have a good amount of supplies for when projects like this come to mind but I did buy some black paint, brushes, black and orange glitter and the pumpkins of course. 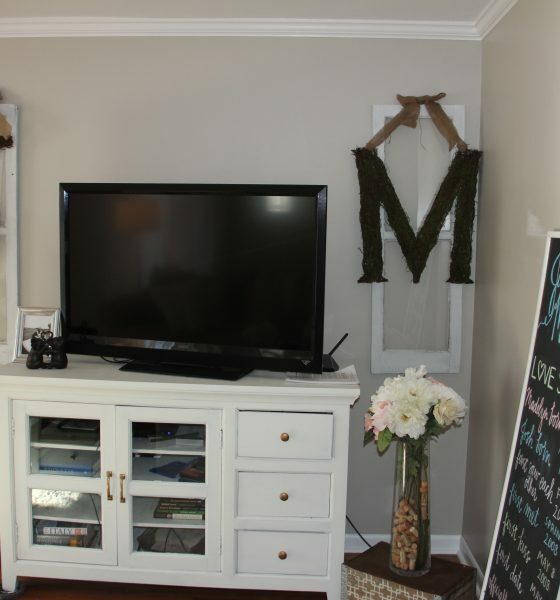 The great thing about projects like these is that you can be as elaborate or simple as you want and it will still turn out cute! 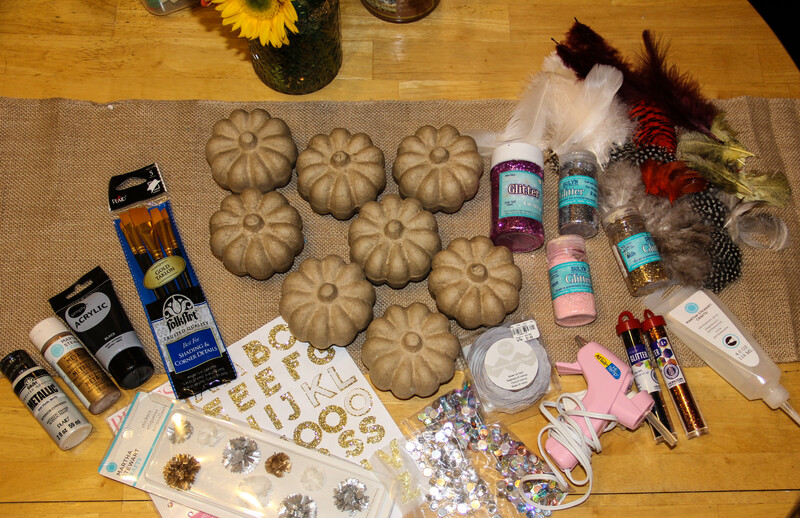 So I know this looks like a total mess and we didn’t end up using all of the supplies here but I like being prepared so I got out a little bit of everything just in case. 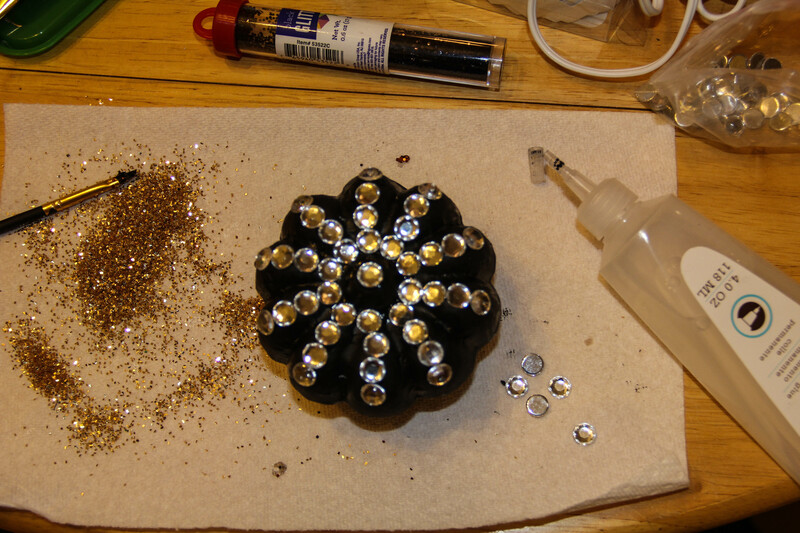 I decided to go with a black/white/metallic theme so just ignore the pink and multi colored rhinestones that keep ending up in all the pics, ha. 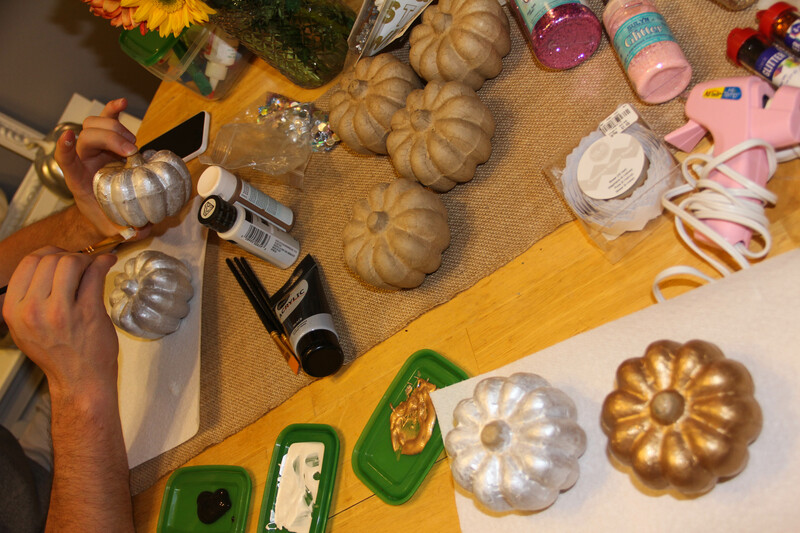 I don’t buy any paper/plastic throw away products besides toilet paper and paper towels so we used the Tupperware I keep my craft stuff in for the paint and just put paper towels down so we didn’t get paint/glitter/glue everywhere. Not that I really care about this table since it won’t be coming to the new house with us but making the least amount of mess as possible is always a plus. 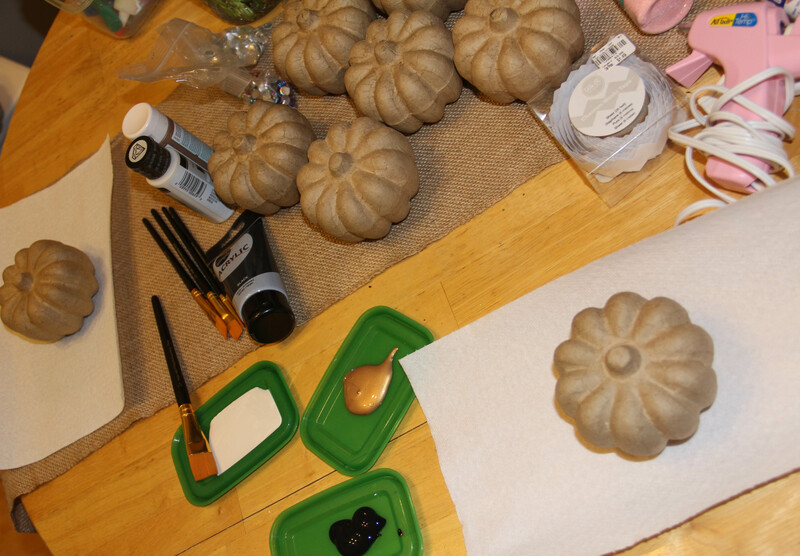 So the first thing we did was paint all the pumpkins a solid color. 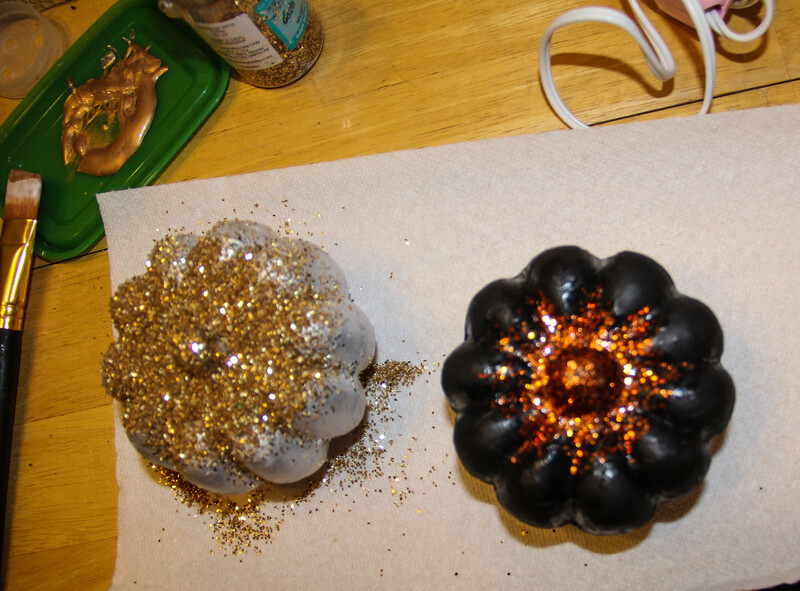 A few silver, a couple of bronze/gold and couple black and then painted another coat on each so they were well covered. You can also use spray paint for a quick and easy DIY. I like this kind the best. 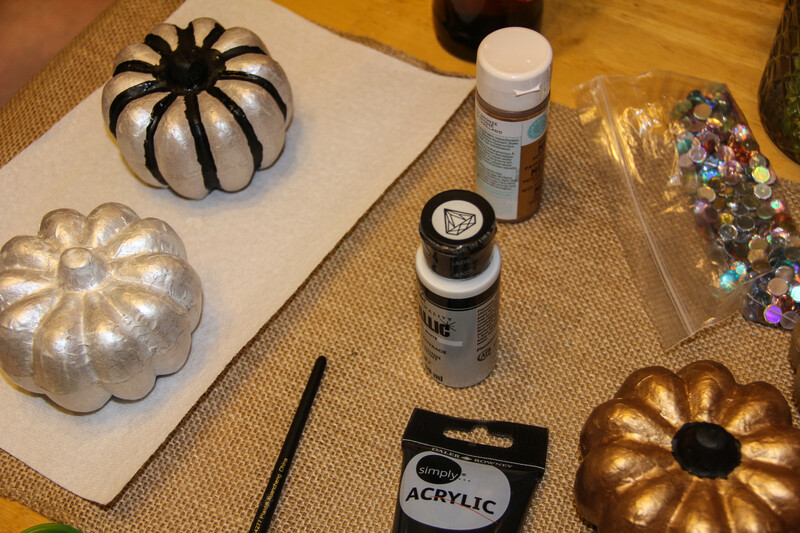 Have you done any fun Fall crafts this year? Let me know! 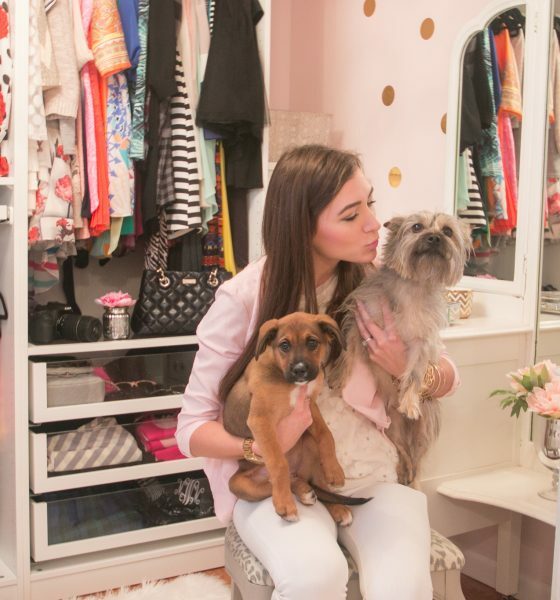 Riley and I are always looking for fun things to try and I will def be doing more for our house, too! Have I mentioned I’m so excited to move and decorate enough yet? 😉 Hehe. Last November I participated in “30 Days of Thanks” on my blog and I am going to do that again this year. I think it’s so important to count your blessings everyday and I want to share them with you each day as the month goes on. I meant to add them to the blog the last couple days but forgot, so I’m playing a little catch up. November 1: So thankful for my “mimosas and the message” bible study ladies and for Lindsay for leading our group and picking out the books we’re studying. November 2: So thankful for the AMAZING weather we’ve had the last couple days. It seriously brightens my mood and is so beautiful. November 3: So thankful that after almost 3 years we finally closed on our first house!! Ah!! November 4: So thankful for friends that believe in and support me. I would love for you to join me in sharing something you’re thankful for everyday this month whether on your Instagram/Facebook/Twitter/Blog/Texts etc. It’s such a good way to enter in the holiday season reminding yourself of all that you already have. I bet you’ll find you don’t actually need anything else. 😉 Thanks for stopping by and have a wonderful day!